If anyone else is around, get in touch and we can meet. I was going to ride over on one of the Bimotas but work commitments decided against that idea. A friend is still going over (on a Yamaha), wish I could make it as it sounds like a brilliant meet. Enjoy yourselves and take loads of photos. I'm going Saturday when the weather is good to me. I have the phone number of Geekay so that we can meet. almost the first bike I saw in the paddock was this Honda enginned SB5, not sure what class it was in but it wasn't in the 4 hour race. Looks good. The Autohaus Sellmann KB1s entered in the 4 hour race, one is a back up. here's the bike during the race, I think it made it to the end as well . .
and a very nicely restored YB4R currently fitted with an FZR1000 engine. This was in the bike park, Vince ! indeed, Luc, Vince, Garry, Steve and myself standing by a Furano completely by coincidence. For sale for 10500 euros. 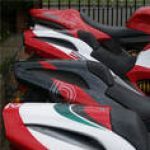 Must be one of the larger Bimota owners meetings so far this year, except Manchester of course. The SB1 which was also here last year. Agostini getting pushed out onto the track with a 500 MV Agusta triple. loads more pictures on my website and there will be films coming soon as well. It was indeed great to meet some forum members. You found my SB6,...... it wasn’t that difficult,......... there were not many SB6’s to search for. Great shot, looks like a brilliant gathering, maybe I'll make it next year. 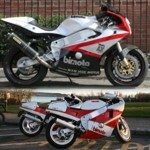 Festival of 1000 bikes at Mallory this weekend, not quite the same but should be very good. Maybe next year.... although TT2014 looks like grabbing the budget! Great pics mate. Looks like it was a fantastic weekend. Good to see the 'Woolongong Wizz' (Gardener) still riding bikes.